The unsophisticated aboriginal of British Columbia is almost a memory of the past. He leaves no permanent monument, no ruins of former greatness. 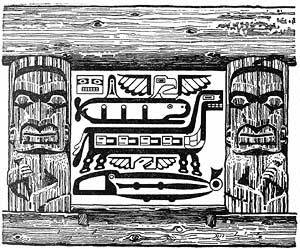 His original habitation has long given place to the frame house of sawn timber, and with the exception of the carvings in black slate made by the Hydah Indians of the Queen Charlotte Islands, and the stone hammers, spear and arrow points, fashioned in the days before the coming of the white man, the mementos of his sojourn in British Columbia are only relics in wood, bark or reeds. In the Alberni District of Vancouver Island there are two tribes of Indians, the Seshaht and the Opitchesaht. During the winter season the Seshahts live in a village which occupies a beautiful and commanding site on the west bank of the Somass River. Some thirty years ago when I first knew the Seshahts, they still celebrated the great Lokwana dance or wolf ritual on the occasion of an important potlatch, and I remember well the din made by the blowing of horns, the shaking of rattles, and the beating of sticks on the roof boards of Big Tom's great potlatch house, when the Indians sighted the suppositional wolves on the river bank opposite the Village. In those days we were permitted to attend the potlatches and witness the animal and other dances, among which were the "Panther," "Red Headed Woodpecker," "Wild Swan" and the "Sawbill Duck." Generally we were welcome at the festivals, provided we did not laugh or show sign of any feeling save that of grave interest. Among my Indian acquaintances of those days was Ka-coop-et, better known in the district as Mr. Bill. Bill is a fine type of Seshaht, quite intelligent and with a fund of humour. Having made friends, he told me in a mixture of broken English and Chinook some of the old folk lore of his tribe. Of these stories I have selected for publication "How Shewish Became a Great Whale Hunter" and "The Finding of the Tsomass." This latter story as I present it, is a composite of three versions of the same tale, as received, by Gilbert Malcolm Sproat about the year 1862; by myself from "Bill" in 1896, and by Charles A. Cox, Indian Agent, resident at Alberni, from an old Indian called Ka-kay-un, in September 1921. Ka-kay-un credits his great great grandfather with being the father of the two young Indians who with the slave See-na-ulth discovered the valley now known as Alberni, while "Bill" gave the credit to the sons of "Wick-in-in-ish." The framework for "The Legend of Eut-le-ten," was related to me by Rev. M. Swartout in the year 1897. Mr. Swartout was a missionary to the West Coast Indian tribes. He spoke the language of the natives fluently, and took great pains to get the story with as much accuracy as possible. A few years later, Mr. Swartout was drowned during a heavy storm while crossing in an open boat from the islands in Barkley Sound to Ucluelet. In the making of the stories into English, I have worked in what knowledge I have of the customs and habits of the West Coast Indians of Vancouver Island. In a few instances, due to a lack of refinement of thought in the original stories, I have taken some license in their transcription. The legends indicate the poetry that lies hidden in the folk lore of the British Columbia Coast Indian tribes. For place names and other valuable information I am indebted to the kindness of Mr. Cox. The illustrations are original and are the work of Mr. J. Semeyn of Victoria.